* 1 yr. FULLSIZE MEMBERSHIP w/all the perks that implies. * LIFETIME FULLSIZE MEMBERSHIP, and all that would imply. 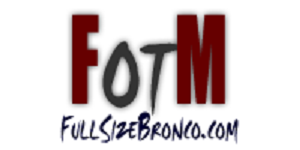 FULLSIZEBRONCO of the MONTH (FOTM) Contests will be held in JANUARY, MARCH, MAY, JUL & SEPTEMBER. Each month in-between will be used for nominating contestants to run in the following Month. Contests will start on the 1st of the month and will run to the last day of that month. In the event of a TIE, the contest will continue between the tied contestants, until enough votes come in to break the tie. 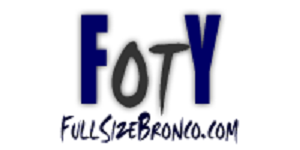 FULLSIZEBRONCO of the YEAR (FOTY) will START in NOVEMBER, between the previous 5 winning contestants. FOTY will run for 6 weeks, ending in early, mid-DECEMBER. Nominations will be held in-between contest months. These months will be as follows… FEBRUARY, APRIL, JUNE, AUGUST, DECEMBER. Nomination will close once we reach 5 nominees or the last day of the month. Whichever comes first. Almost anyone can Be NOMINATED... from the sites Admins/Moderators to the newest of n00bies, basically anyone you feel like NOMINATING, that OWNS a FULLSIZE BRONCO and is old enough to LEGALLY DRIVE that BRONCO. It will be the RESPONSIBILITY of the NOMINATOR to notify their NOMINEE by whatever means necessary. If we do not receive confirmation from any nominee within 2 days of their nomination, they will be REMOVED and the next nominee, by order of nomination will take their place. Each member nominated will have to CONFIRM their entry into the contest. By doing so, they are AGREEING that they are willing to PARTICIPATE in the contest and CONDUCT themselves in accordance with the rules listed on this page. If (for any reason) a nominee does not wish to participate... they will be removed and the next nominee by order of nomination will take their place. If you do not want to participate in the FOTM contest, please state it BEFORE you are on the ballot. You can ONLY be Nominated and WIN once a YEAR. If you win this year, say JULY for example, then you would not be eligible to be Nominated until the following AUGUST. This is Fullsize Bronco Of The Month, not FSB member of the month. You are voting for the Bronco you like best. Please keep in mind that the Bronco chosen for FOTM/FOTY will represent FULLSIZEBRONCO.COM in Bronco Driver Magazine. Bronco Driver Magazine will accept direct, personal submissions for entry. So there is no reason for anyone to try and manipulate this contest for the sole purpose of appearing in the magazine. Each member can only VOTE ONCE. DO NOT have friends, family or co-workers sign on just TO VOTE for YOU. Any violation of this rule will result in immediate disqualification and removal from the contest. No pictures or lengthy discussions of other projects or other vehicles. If you feel the need to discuss other topics, please use other areas of the forum. Please keep the chit chat in the FOTM/FOTY threads to a minimum. Any violation of this rule may result in immediate removal of the offending post and repeated violations may result in disqualification and removal from the contest. Any member that wishes to be removed from the contest (once it has started) will be allowed to do so, but all VOTES given to that nominee shall be forfeit and the nominee will be in-eligible for the following 2 contests, so please... be considerate of your fellow members when considering dropping out of the contest. Along the same lines... any member removed by disqualification or banned from the site will be treated the same as one wishing to be removed. All votes given will be forfeit... occasionally votes may be granted back to those that voted for a removed nominee, but this is NOT standard practice and will be granted depending on the specifics of a given situation... according to staff decision. Contestants disqualified from the contest will not be eligible for nomination again, for one full year. In the event of a catastrophic occurrence (NATURAL DISASTERS, SERVER PROBLEMS, HOLIDAYS, ETC.) we will consider extending the contest to make up for lost time... according to staff decision. In the event of a tie, the voting will continue for the two or three that are tied, ONLY. Again, contestants will only post pictures relating to the Bronco for which they are nominated. No pictures or lengthy discussions of other projects or other vehicles. If you feel the need to discuss other topics, please use other areas of the forum. Please keep the chit chat in the FOTM thread to a minimum. * NOMINEE BASHING WILL NOT BE TOLERATED. * THREAD HIJACKING WILL BE LIMITED. * SPAM PRIVATE MESSAGES WILL NOT BE ALLOWED. * USE GOOD TASTE AND COMMON SENSE, THIS IS A FAMILY FRIENDLY FORUM. * VIOLATION OF ANY OF THE STATED RULES ABOVE CAN RESULT IN IMMEDIATE DISQUALIFICATION. * POST THAT VIOLATE "CONTEST BEHAVIOR" RULES ARE SUBJECT TO STAFF EDITING OR REMOVAL! 1 point = removes members from FOTM/FOTY voting, using the classifieds, and the FSM forum area. 2 points = 7 day temporary ban from FULLSIZEBRONCO.COM Website/forum. 3 points = permanently banned from the FULLSIZEBRONCO.COM website/forum. All this said Good luck to all runners and lets have have some fun with FOTM v2.0! OlRed94 and PoppaGator like this. Last edited by miesk5; 02-13-2018 at 02:10 PM. Reason: As disussed w/Erick, changed "...every other month" to "Contests will be held in JANUARY, MARCH, MAY, JUL & SEPTEMBER..."